April is all about Biking: Then ride a hot air balloon in Napa! What’s one of the most popular activities, aside from a Napa hot air balloon ride, second to sipping wine? Cycling! From professionals who bike the rigorous mountain trails daily to the average Joe who just wants to explore the valley, biking is a beloved sport in California and one of the best ways to experience the region. In an attempt to create a more green environment, Napa County is promoting and creating more bicycle-friendly routes. A great feature of the valley is that every biker can find the perfect route for themselves. Whether you want a hilly trail that tests your strength or a flat road to take you around the town, you can find it in Napa County. For advanced/intermediate riders consider Old Howell Mountain Road. You’ll power up the mountain and speed back down on this 11-mile journey. The views are gorgeous and the traffic is rare, even on busy days. You’ll even get a view of a Napa hot air balloon – make that a lot of hot air balloons on a sunny early morning. Looking for a longer route? Consider Pope Valley Loop. This is a real test of your strength with 40 miles of a beautiful views, diverse terrain, a few wineries, and a lot of exercise! For intermediate/beginners, Conn Valley Lake Hennessey is a great choice. This 12-mile route takes you through everything, including scenic views, famous wineries, picnic areas, lakes, rural roads, vines, and tranquility. This may be a little challenging but definitely worth the ride if you’re looking for an adventure. Don’t forget to look up and see a hot air balloon in Napa passing by. What’s new in cycling land? The Napa Valley Vine Trail Coalition is a grass-roots nonprofit with a vision of creating a 47-mile walking/biking trail system from Vallejo to Calistoga. So far you can ride the 12.5 completed miles from South Napa to Yountville – perfect for visiting wineries and viewing the verdant hills of the region, while stopping for a Napa hot air balloon ride! Visiting Napa? Consider a Napa Valley Bike tour and joining a guided tour of wineries, restaurants, and nature trails. Please drink and ride responsibly – make sure to save most of the tastings for the end of your bike ride. Not a fan of guided tours? Check out one of the many bike shops in Napa and just rent and explore. And then make a stop to view the Napa hot air balloon that will surely pass over. There are big events coming up for biking enthusiasts! Cycle for Sight is an exciting event on Saturday, April 21st for beginners and professionals. The event benefits Enchanted Hills Camp for the blind and visually impaired as well as The Pathway Home, a home for Veterans. Join families and friends and ride in unity to support the local community. Want to combine your love for food, wine, cycling, and a lot more? April 27-29 is CampoVelo. This is a 3 day event packed featuring famous chefs, a lot of bicycle rides, receptions, fashion shows, and yoga! What to do when you wake up sore from your 20-mile Bike ride? Ride a Hot Air Balloon in Napa! Tour the valley without really moving… in a Napa hot air balloon! After your intense bike rides, nothing sounds more relaxing than floating above the valley. Ask anyone who has visited and they’ll tell you, the best views are from a hot air balloon in Napa. What better way to relax than flying over Northern California in a balloon with some of the most experienced pilots around. Balloons Above the Valley offers this unique experience, being one of the first companies here and owned by a hot air balloon pioneer – Bob Barbarick began flying balloons in the 70’s and never looked back. He established Napa hot air balloon rides, allowing people to the experience the valley from high above for the very first time! Browse through the many flight options like a single ride hot air balloon Napa, or a more popular option consisting of a Champagne Brunch and a Napa hot air balloon ride. Want to include wine on your adventure? Balloons Above the Valley offers a wine tour, brunch, and balloon ride package. Scared of heights? 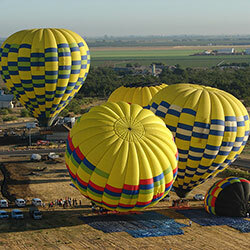 Just follow the Napa hot air balloon from the ground with our ground team by choosing the Chase package. There’s so much to explore in a hot air balloon in Napa with Balloons Above the Valley. On your next visit to Napa Valley, take some time exploring all the great bicycle trails, join a bicycle tour, and end your trip in the most breathtaking way possible – from a Napa hot air balloon.